Depart from Reykjavik Domestic Airport for your flight to the Arctic village of Ilulissat, beautifully situated at the mouth of the 56 km long Ilulissat Icefjord—a UNESCO World Heritage Site. On arrival, you will be transferred to your accommodation for the next three nights. 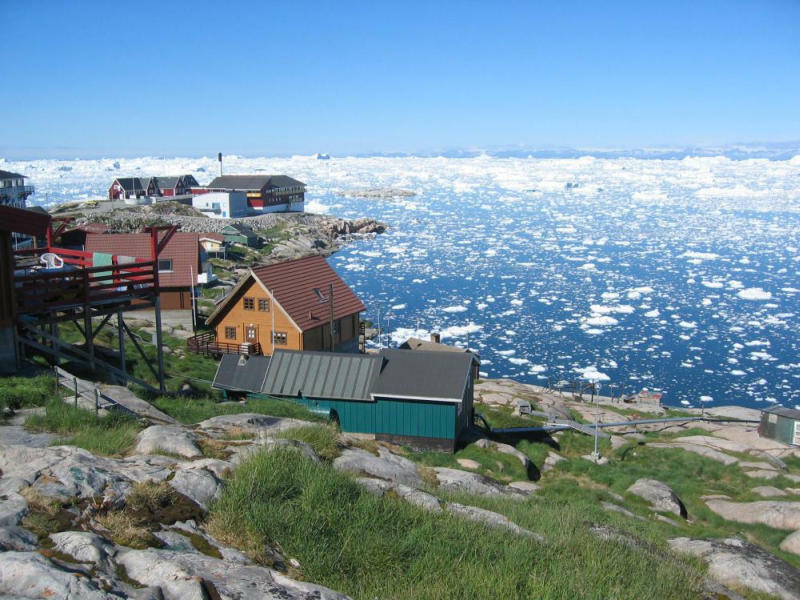 Get to know Ilulissat and its people with a guided culture walk! Your guide will tell you all about the history of this town and introduce you to the native Greenlandic culture and daily life of the local inhabitants. The tour also includes a visit to local fishermen and hunters at the “Brædtet” trading post by the harbour as well as a stop to the birthplace of the famous explorer Knud Rasmussen. 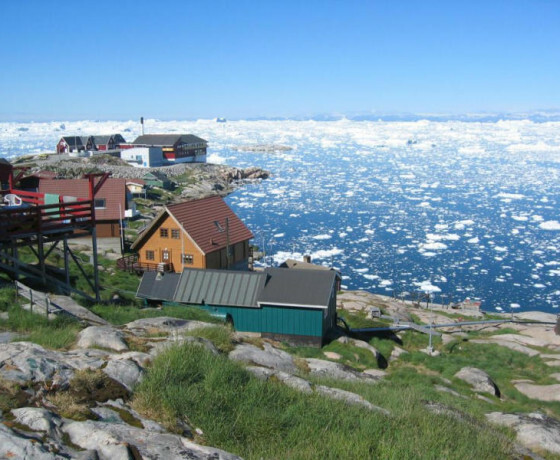 Get to know Ilulissat and its people with a guided culture walk! Your guide will tell you all about the history of this town and introduce you to the native Greenlandic culture and daily life of the local inhabitants. The tour also includes a visit to local fishermen and hunters at the “Brædtet” trading post by the harbour as well as a stop to the birthplace of the famous explorer Knud Rasmussen.Choose your own Arctic adventure today! You can explore the town at your leisure or select from a variety of optional day tours in the area, such a helicopter ride over the ice cap, a cultural demonstration, a tour to an old settlement or a guided snowmobile tour—just to name a few options. If you’re up for a hike, the tranquil Sermermiut Valley just a few kilometres from town offers spectacular views from a number of marked trails that you can explore at your own pace. 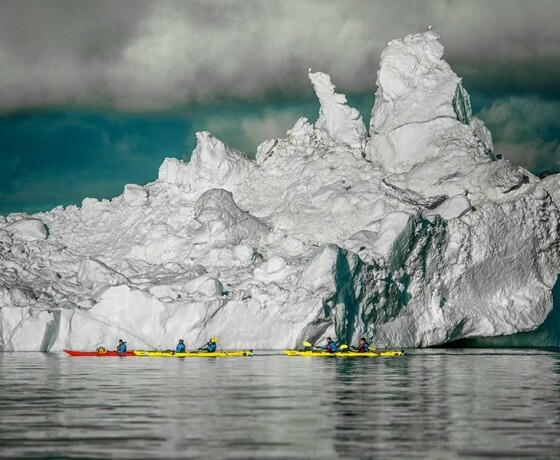 Note: We recommend booking any optional activities in advance with your travel consultant at Nordic Visitor, although you are also welcome to book them at your hotel in Ilulissat after arrival. Today you will head out on your 2-day dog sled adventure, an authentic way to experience the traditional transportation in Greenland and a test of your strength against a real Arctic winter. Under the guidance of a skilled local musher, you will drive with your own sled and team of dogs to Aattartoq and glide over the sea ice in the Sikuiuitsoq fjord, where towering icebergs are frozen in place. Tonight you will camp with your tour group in a tent or a primitive hut by the edge of the Inland Ice Cap, with the “Dead Glacier” (Sermeq Avannerleq) towering above. Note: This tour requires no prior dogsledding experience though it is very physically demanding. This excursion does need 2 passengers minimum, so please check with your travel consultant if you are a single traveller. After a good night’s sleep you will journey back to the civilisation. If weather and snow conditions allow, the lead musher will attempt to take you to the inland ice before continuing back to Ilulissat. Back in town, you can spend the rest of the evening relaxing at the hotel, where we recommend enjoying a traditional Greenlandic Coffee as a night cap. Spend the next three nights in Ilulissat. Enjoy your day in Ilulissat either by relaxing at the hotel or strolling around the charming village. You also have the opportunity to try more optional activities, such as a boat tour among the icebergs or a short dog sled excursion to further develop your mushing skills. And if the skies are clear tonight we suggest going outside and trying to spot the magical northern lights, also called aurora borealis. Note: Optional activities can be booked in advance or at your hotel in Ilulissat. Please also keep in mind that the northern lights are a natural phenomenon, so sightings cannot be guaranteed. 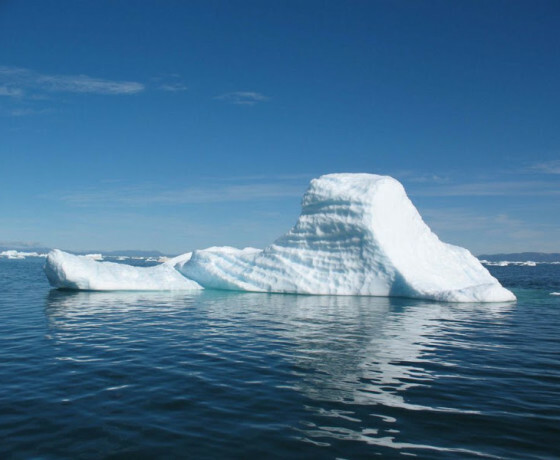 Today will be unforgettable as you sail among icebergs that weigh up to seven million tons—giant chunks of ice as big as multi-story office buildings! 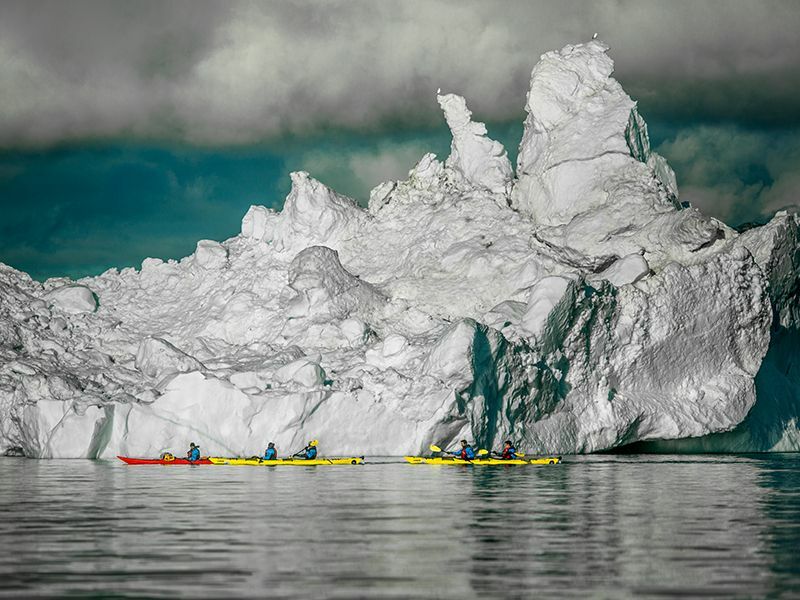 This amazing boat tour heads out to sea in the Disko Bay where these giants float at the edge of the Icefjord. 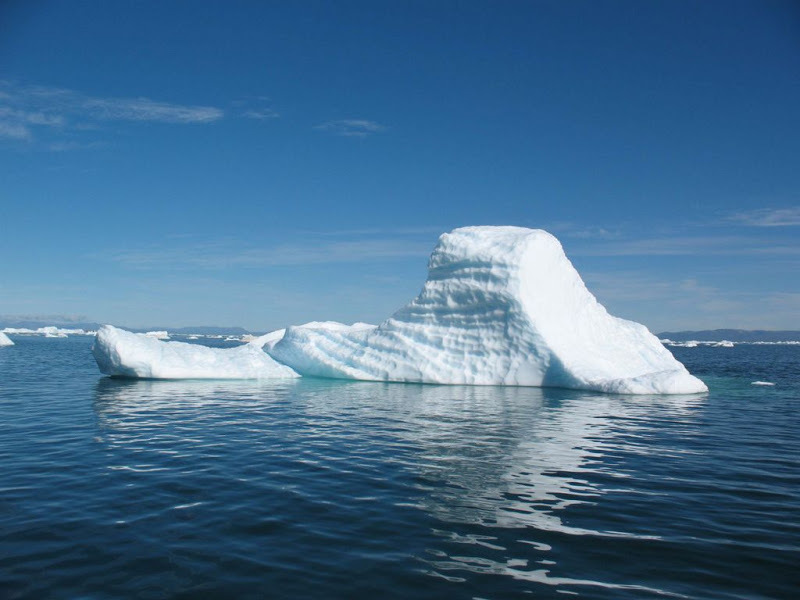 The icebergs are beautiful in every kind of weather and we might get lucky and see some Arctic sea life during our voyage. After some last-minute souvenir shopping or exploring the town, it’s time to say goodbye to this land of adventure. Transportation will be provided to the Ilulissat airstrip for your return flight to Iceland. Note: All activities included in this package are dependent on weather conditions and minimum participant requirements. In the rare event that an activity is cancelled for these reasons, you will be refunded for that activity. Also, this tour can be customized to fly from Copenhagen (Denmark) instead of Reykjavik (Iceland), with arrivals available from Monday to Saturday. Contact us for details.